A French anthropologist and behavioural archaeologist will present an address in Nelson this week that shimmers with mystery and intrigue. In "Investigating the intangible: the skull chamber in the Chauvet cave", Dr Yann-Pierre Montelle will discuss data gathered in his last archaeological campaign in Chauvet in March of this year. The cave in the Ardeche department of southern France contains the earliest known cave paintings, as well as other evidence of Upper Paleolithic life. 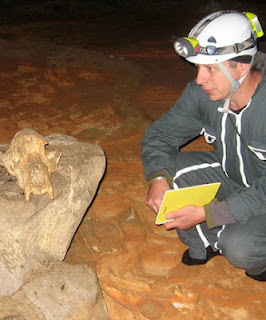 Dr Montell's talk will centre on a case study and data collected from the cave's "skull chamber". A deeper theme of his address will be the way in which the expectation of contemporary cultural traits can hinder the investigation of the "intangible dimension of material culture in the context of prehistory". Dr Montell is best known in this country for his ongoing work in mapping, describing and photographing Maori "rock art" sites in the South Island. His visit has been arranged by the Nelson Science Society. Tuesday, May 22, 7.30pm, at NMIT building A211. All welcome, non-members $2 admission.